BANGKOK /OSLO, 11 August 2017 – It’s International Youth Day, and organizations around the world are celebrating young people’s contributions to conflict prevention and transformation, as well as inclusion, social justice and sustainable peace. 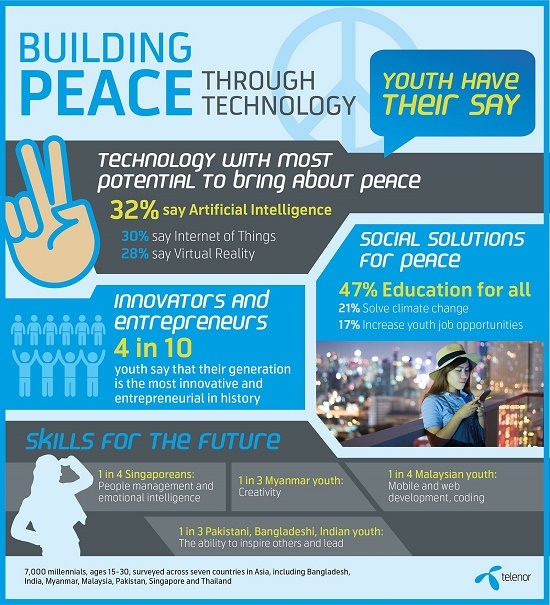 Telenor Group recently reached out to Asian youth on these topics, and the majority say that they view artificial intelligence and access to education as crucial for building peace and improving their communities. The findings were gleaned from two surveys of Asian youth, assessing their attitudes toward peace-building, harnessing technology for social good and securing the jobs of the tomorrow. Together, Telenor Group surveyed nearly 7,000 millennials, ages 15-30, in seven markets in Asia. The two Telenor online surveys were conducted in May of 2017 and September-October 2016. When asked which technology has the largest potential to give rise to peace, 32 percent of the respondents placed their bets on artificial intelligence, followed by the Internet of Things (30 percent), and virtual reality (28 percent). Across all markets, artificial intelligence, the Internet of Things and virtual reality rank consistently in the top three – suggesting the vast potential seen in these future technologies by the millennial generation. Among social causes that can lead to peace, including environmental protection, unemployment mitigation, education inclusion and civil rights, Asian youth responded that they are most passionate about education. Thirty-seven percent of survey takers ranked this as their top cause. Forty-seven percent of them say that leaders should invest more in developing inclusive education systems that give equal access and opportunities to all. Youth respondents’ second-ranked cause was climate change and global warming (21 percent). Other global issues prioritized by Asia’s millennials include mental health (17 percent), youth unemployment (17 percent), and gender inequality (8 percent). One thing that united all markets surveyed was the youths’ own perspectives of their place in the world. Uniformly in all surveyed markets, nearly 40 percent of the youth described themselves as ‘the most innovative and entrepreneurial generation in history’. In a second Telenor survey, youth in Singapore, Malaysia, India, Myanmar, Bangladesh and Pakistan were polled on their attitudes about their future career, technology’s impact and the skills they need to be best prepared for the jobs of tomorrow. The results indicate that while Asia’s young adults embrace the importance of technology, non-technical human skills still play an important role. The highest numbers of Pakistani, Indian and Bangladeshi youth maintained that the most important skills to obtaining a great job in the future will be the ‘ability to inspire others, and leadership capability’ (37-, 36-, 34 percent respectively). More than one of four surveyed Singaporean youth cited ‘people management and emotional intelligence’ (27%) as needed skills. Nearly one in three Myanmar youth said that ‘creativity, cognitive flexibility’ (29%) are critical. The standout in this category was Malaysia, where 24% of the surveyed youth stated that tech-related ‘mobile and web development, and super coding skills,’ were most important. “Today’s youth have opportunities unlike any generation before. They were born into a connected world, and we want to know more about the roles that they believe technology can play, both in their own lives and in bettering the world around them. At Telenor, we believe that connectivity and digital services play a fundamental role in improving lives, and it’s inspiring to learn that Asia’s youth are with us in this mission,” said Ola Jo Tandre, Head of Social Responsibility, Telenor Group. “This is exactly why we work with them every year through our Telenor Youth Forum, where we have them innovating new solutions to some of the many challenges facing their generation,” he added. Initiatives such as the Telenor Youth Forum provide a global stage for youth to brainstorm and create innovative concepts that can drive real change in the world.